Horti Sallustiani. Although within the limits of region VI, these gardens, with the horti Lucullani and horti Aciliorum, formed the northern group of parks, just as those on the Esquiline formed the southern. They occupied the northwest slope of the Quirinal, the southeast slope of the Pincian as far as the via Salaria vetus, and the valley between, extending nearly to the line of the Aurelian wall in one direction and to the campus Agrippae in the other. They were laid out by the historian Sallust, who lavished upon them the great wealth which he had amassed in Numidia, and they continued in the possession of the family of the Sallustii until the reign of Tiberius. After that time they were a favorite residence of the emperors, especially Nero, Vespasian, and Nerva, and later Aurelian. In 410 A.D. they were sacked by the Goths under Alaric. It is probable that these gardens were on the whole the most magnificent in Rome. Many works of art have been found within the ruins, as well as the obelisk which now stands in the piazza di S. Trinita dei Monti. Within the gardens were many buildings of various kinds, of some of which architectural fragments have been found, but usually not such as to admit of identification. Several inscriptions prove the existence of a temple of Venus hortorum Sallustianorum, and an attempt has been made to identify this temple with a round structure near the porta Salaria, the ruins of which were discovered in the sixteenth century and described by architects of the time. This structure, however, was not a temple, but rather a nymphaeum, connected with the elaborate system of water supply installed in the gardens. 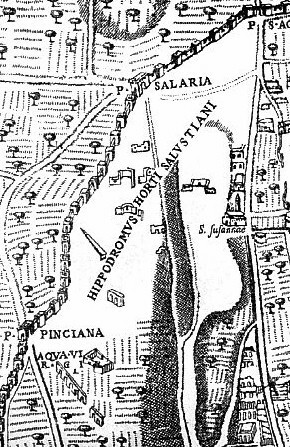 The remains of three piscinae belonging to this system have been found, one on the north side of the vicus portae Collinae (via Venti Settembre) opposite the Treasury, one in the vicolo di S. Niccolo da Tolentino, and the third under the casino Aurora in the via Ludovisi; also a number of lead water pipes inscribed with the names of Nero, Alexander Severus, and Valentinian. Aurelian constructed a porticus Miliarensis a name which should mean a porticus one thousand passus in length within these gardens, and this is frequently located on the north side of the vicus portae Collinae, but without convincing evidence. A porticus of this length must have run about the gardens in various directions. "Thus began the third Visigothic siege, actually blockade, of Rome, an event whose outcome, after some eight centuries in which the imperial City had known impunity from foreign foes, created a shock of horror from Bethlehem to Britain. Once again Gothic bravery found itself daunted by the walls of Emperor Aurelian; the treachery that the Romans had feared in the beginning of 408 now in fact admitted the Goths by the Salarian Gate, 24 August 410, but not before the City had once again felt the bite of famine. Some buildings were burned, notably the Palace of Sallust the historian, which stood in its magnificence gardens near the gate of entry, perhaps the Basilica Aemilia in the Roman Forum, and the Palace of Saint Melania and Pinianus on the Caelian Hill, then one of the most fashionable quarters of Rome. Palaces and temples were plundered, some persons were slain or tortured to reveal their presumed hidden wealth; some virgins and other females were raped, but churches, especially the basilicas of Saints Peter and Paul, were spared and made places of refuge." Stewart Irvin Oost, Galla Placidia Augusta: A Biographical Essay (Chicago: The University of Chicago Press, 1968), pp. 96-7. Giovanni Battista Piranesi, Ichnographia Campus Martius (1762), detail. The Horti Valeriani is situated in the upper right corner, directly above the Horti Sallustiani, which occupies the entire bottom portion of the plan. Note that the Aurelian Wall is delineated via a bowing dotted line, which is visible directly above the words 'Horti' and 'Sallustiani'. The position of the Salarian Gate is indicated along the dotted line, here circled in red. 2. the circle/square Porticus Neronianae marks the spot of Alaric's Visigoth camp prior to the (primal) break-in at the Porta Saleria. The 45 degree marks of the Porticus Neronianae marks the four cardinal points. Since the compass of the Ichnographia matches the center of the Porticus Neronianae in size, perhaps Piranesi is here indicating the spot where the "winds" shifted--the historical winds. I now know how the Nolli map corresponds with the Campo Marzio area of the Celian Hill/Horti Salustiani. Platner provides an interesting history of the "Domus Valerianus"--nobody bought it in 404 AD; it sold for almost nothing after Alaric 410 AD; it appears to have become a hospital (which makes sense with regard to Melania's mission.